The concept of the niyamas (observances) contains several actions: saucha, samtosha, tapas, svadhyaya and Isvara-pranidhana. While the yamas were external actions, niyamas are more contemplative actions. Saucha can be as simple as taking a shower (which is sometimes difficult for a new parent), brushing your teeth and eating healthy food to getting physical exercise, breathing properly and meditating. But we must not spend too much time on physical appearances. It is good to be fit and thin, but beauty is fleeting. It’s what’s inside that matters. Isn’t that what you want to teach your children? Sometimes when we are stressed out as a mother, what we sometimes need is a time-out from our parenting duties. (This can also be a form of pratyahara, or sense withdrawal.) This can be five minutes, or it can be a full day if we have the luxury of doing so. Often when we are able to take a step back from our problems and take some time to rejuvenate our mind and our bodies, we can solve the issue. Once we have a pure mind, deep and inherent knowledge will come our way. We just have to “empty our cup” and be willing to receive it. Suppose you have been agonizing over how to properly discipline your toddler, and suddenly, after a particularly rocky period, an idea pops into your head – and it works. This is called listening to your intuition and allowing that internal knowledge to come to you. This often occurs after we wake up from sleep. Although the mind seems to be at rest, your unconscious state is never asleep – it is recharging and checking in, passing along wisdom locked inside. Self-sacrifice, selfless giving and self-discipline, in fact, should not be renounced. Instead, they should certainly be continued because such actions purify the mind and make you wise…After you renounce all personal attachments, you will be filled with purity and clearly discern the nature of dispassion. Then all remaining doubts fall away, and you feel neither aversion nor attraction toward unpleasant or pleasant work. If we don’t have a pure mind, then it is difficult to control our actions (yamas). Swami Chidananda once said, “The mind is more than a thousand tigers, and once a particular action is indulged in, it becomes an inveterate addict to that action.” This statement just demonstrates the earlier point that each limb of ashtanga is equal to other. Without one, you can’t have the other. With samtosha, we can learn to accept the situations that we are in and be satisfied with what we have. Swami Satchidananda says, “Contentment means just to be as we are without going to outside things for our happiness.” This is a tricky concept to swallow for some. 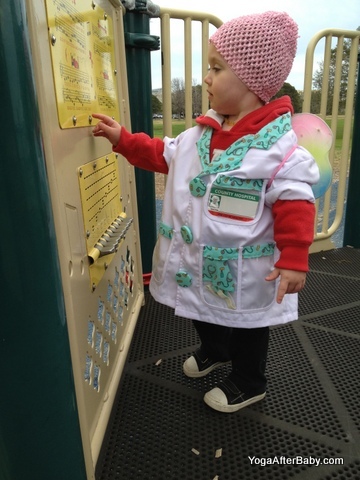 My daughter wanted to go to the park….in her doctor’s coat…while wearing her butterfly wings. That’s OK with me! Oftentimes, in parenthood, child rearing feels like a competition: a baby may hit milestones later than others of his or her age, making you – the mother – feel inadequate, or perhaps your child may not have as nice of toys or belongings as another child. Contentment, in a mother’s perspective, means accepting your child and yourself as you are, with all the ups and downs that come with it. When things go wrong, like if your toddler spills a glass of water on the table, accept what happened, correct your child, learn from the experience and move on. The practice of nonattachment, or vairagya, is crucial here. Nonattachment is not indifference, but it is the ability to know whether an object is good for you. Satchidananda says, “When the mind is tossed by these desires one after the other, there won’t be peace or rest in the mind. And with a restless mind you can’t have steady practice [of yoga].” By practicing vairagya, we will know whether it is rational to hang on to painful memories of missed goals or to pine for material things. By practicing tapas, we accept but do not cause pain. Some days, it may seem that, as a mother, you practice tapas every minute of the day. Something is always causing you to suffer, and you just have to bear the pain. The direct meaning of tapas is ‘to burn’…By the physical tapas of fasting, we burn our excess fat away along with the toxins our bodies have accumulated. By mental tapas, we burn all our old impressions. By verbal tapas, observing silence, we control speech. When we burn, we feel some heat and pain. We undergo suffering. So, tapas also means to accept suffering. If someone suffers, he or she is blessed, because by that suffering some impurities are purged out. You may have noticed that some mothers are totally serene in the face of their children losing control and having a meltdown. You may wonder, how do they stay so calm? It’s probably because they’ve seen this all before. Surely, they felt great suffering when their child had a tantrum the first time, sometimes in public, and maybe she didn’t react appropriately. That is a form of tapas. Over time, she’s overcome those initial reactions and carved out new ways to cope with the situation. Had she not experienced those first stress-inducing tantrums, those mothers wouldn’t have grown wiser. It’s also helpful to remember Satchidananda’s words, in the face of tantrums: “Don’t think that if someone causes us pain they hate us, but rather that they are helping us to purify ourselves.” Remember, our children are so comfortable with us, they show us their ugliest behavior. Eight months old and sick as a dog with RSV. Bearing her pain and giving her the comfort she needed. There are so many examples of tapas when it comes to parenting. Some are unmedicated childbirth and letting your child get scrapes and bruises as they learn to crawl, walk, run and climb. Two more examples spring from the same situation: bedtime. For some, tapas could mean not letting your child cry it out at night. For many mothers, listening to your child cry alone in a room is heartbreaking. But at the same time, you really want your day to be over so you can have a break. So if the crying is too much to bear, you sit with your child and you wait (sometimes for hours) and cuddle them until they fall asleep. The opposite situation could be argued as tapas, where you let your child cry. While it can be torturous to listen to your child sobbing for you, as a mother you believe that this is just a lesson that they are learning early in their life. All of these paths may be difficult and painful, but the results you (and the child) receive are ultimately worth it. Also keep in mind that there are other ways to do tapas. This often means ridding your body of toxins by eating healthy foods and practicing asana and pranayama. Cutting out junk food and eating whole, unprocessed foods not only is good for you, but it also sets a good example for your child. The great South Indian saint Thirumulai, who is said to have lived for more than 3,000 years, talks about the importance of the body. He clearly says that you can’t realize God without it. God has given you the body as a ladder to climb up. The ladder itself is not going upstairs, no doubt. But you need to go up, so you have to take care of it. In the same way, the body is your vehicle. With the help of the body, you are walking the path. Torturing the body is not a spiritual practice. Don’t go to the extremes. Suppose there is a big race-horse costing fifteen thousand dollars. The owner will not allow it to run here and there and take in every kind of food. Only concentrated food will be given to it. Similarly, the mind is a very precious horse. It will take us to Brahmapuri or the Supreme Abode. Supposing the owner does not want the horse to go here and there, he will select good grass. He will take the horse there, drive a peg in and tie it around with a rope. Here, there is some degree of freedom to the horse. It is a limited freedom. Suppose the rope is about thirty yards long, the horse can move about within a circle of sixty yards diameter. It means that even though it is tied down, it has got freedom to take anything that it likes within that area. That is what svadhyaya does. If you take the habit of svadhyaya, it creates in your mind a new pasture-ground. Formerly, it was limitlessly roaming, but now you can give to this mind a confined, selected field for its intake. What happens is by constantly confining it to this frame-work of svadhyaya, the mind goes on taking the idea contained in the spiritual texts. It does not go beyond these bounds. It becomes habituated to svadhyaya. This is another aspect of svadhyaya, which all seekers should understand. For parents, svadhyaya can be practiced by reading books that helps elevate and fix your mind on the truth of your existence. Reading to your child is another practice of svadhyaya. Most children’s books have a moral at the end of the story. By reading it, you are reinforcing the message within yourself and then teaching it to your child. Discussing the story after you’re done helps your child think about it more. Other examples of cultivating svadhyaya in your parenting style include taking them to a house of worship or Sunday school or immersing them in nature and teaching them to respect Earth. Once your mind has been exposed regularly to these insightful passages and methods, it will think differently and want more and more. Keep feeding that hunger. The last of the niyamas is Isvara-pranidhana, which means the worship of or surrender to God. You can also substitute humanity, or even your child, if you do not believe in a higher power. In Isvara-pranidhana, the ego is silenced, because you cannot hold a constant attitude of worshipfulness, devotion, faith and humility when the ego is at work. Satchidananda says, “Whatever we do can easily be transformed into worship by our attitude.” For example, we can practice Isvara-pranidhana by doing the laundry, changing our child’s soiled diaper, putting a child to sleep, washing the dishes, reading them a story – ANYTHING – as long as we keep a good attitude. 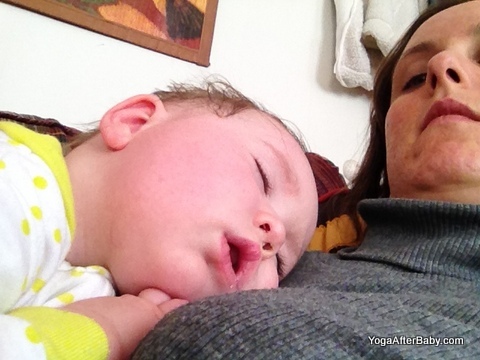 When your child is young, you may not have time for asana, pranayama or dhyana. As long as you keep a right attitude and devotion toward God, your family or humanity, Isvara-pranidhana will automatically come to you. All worry is due to attachments and clinging to possessions. The attachment I mean is mental attachment. What we want is a mental, rather than a physical detachment. We can even possess things physically if we are mentally detached. This is continuous samadhi [realization]. We shouldn’t think samadhi means sitting in a corner, forgetting ourselves and keeping the body still like a rock. Real samadhi means tranquility of mind, which is possible only when we dedicate everything and are free from all attachment. A good place to start cultivating Isvara-pranidhana is the practice of bhakti yoga, which is one of the four paths of yoga. To be a bhakti yogi means to worship God at all times; the practice is mostly identified through song. This is perfect because most children love music and singing, so this is a great way to introduce devotion. It can be a religious song, or secular; it’s just a way for you and your child to be thinking about what’s really important in this life. Practicing bhakti yoga will naturally lead to Isvara-pranidhana.